The Brafferton Hall at the College of William and Mary is one of the three buildings that comprise the “Ancient Campus”. was built to educate Virginia Indians during the early 18th century. Funded by a bequest from Robert Boyle, the English scientist who discovered the circulation of blood, the Indian School was operated intermittently during the 18th century, without much success. Today the Brafferton houses the office of the President of the College. It is located to the left as you walk into Wren Yard (at the west end of the Duke of Gloucester Street). This area is known as the historic heart of the campus. Of course the Fife and Drum Inn is conveniently located just one block to the north. In front of the Brafferton, and in the center of Wren Yard is a statue of Lord Botetourt. 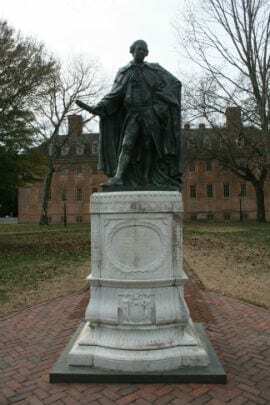 The statue honors the popular 16th century governor of the colony of Virginia. Botetourt was actively involved in the academic life of the College of W&M and the colonial capital, he served as Rector of the Board of Visitors of the College. He was instrumental in establishing a fund to create two gold medals that would be awarded on an annual basis by the College for those that excelled in natural philosophy and classical learning.